Some board games are known for their iconic characters. You know the Monopoly guy, all the folks from Candyland, the mouse from Mouse Trap, the cast of suspects from Clue, and more. But one of the flagship characters from Cheapass Games might be new to you. His name is Doctor J. Robert Lucky, and players have been trying to kill him for twenty years now. The game Kill Doctor Lucky has taken many forms over the decades — including several versions where players tried to save the infamous doctor instead — but the newest variation takes things in a spookier direction. 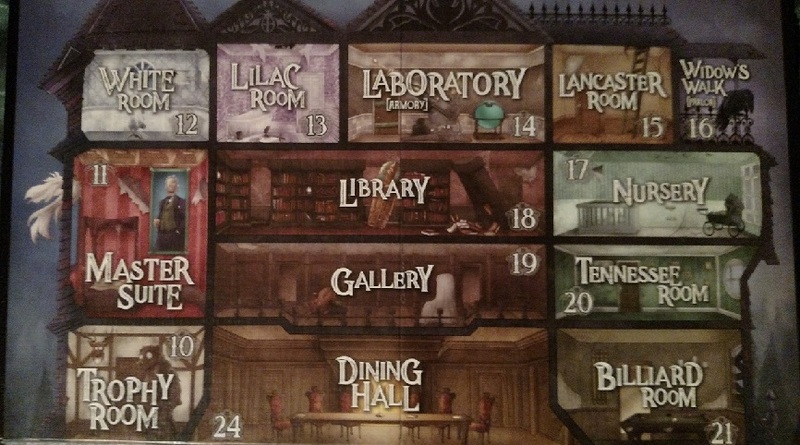 In today’s review, we look at Doctor Lucky’s Mansion That Is Haunted. This expansion includes a new game board and new instructions, but that’s all; everything else you need to play is contained in the Deluxe 19.5th Anniversary Edition of Kill Doctor Lucky, including cards and tokens. The endgame is also the same: kill Doctor Lucky before another player does. And while the same rules apply — you have to be alone in the room with Doctor Lucky and out of sight of every competitor — this expansion adds one curious wrinkle: all of the players are ghosts. You see, in Doctor Lucky’s Mansion That Is Haunted, Doctor Lucky is trying to sell off his famous mansion, but the ghosts who also reside there wish for Doctor Lucky to stay, and they’ll go to any lengths to keep him around. And you might not think that one curious wrinkle could radically change a game, but you’d be wrong. The fact that you’re a ghost means you can pass through walls, ceilings, and floors. That is a huge alteration in both strategy and game mechanics. 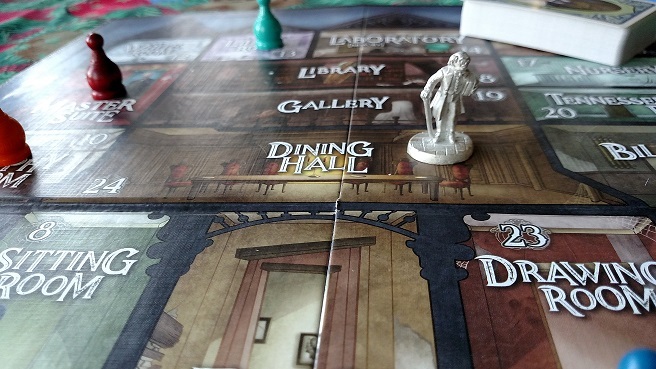 You can more quickly maneuver into a room with the Doctor, but you can also thwart your opponents by sneaking into a neighboring room and spoiling their murder attempt by observing the proceedings through an open door. Factor in the secret portals connecting several of the rooms, and suddenly the mansion is much more accessible. This expansion harkens back to the early days of Cheapass Games — when they would send you the necessary pieces for their game and encourage you to harvest the extra bits (like dice and tokens) from games you already owned, thereby saving money all around — while adding new touches and revitalizing a game you already know quite well. Plus, if Kill Doctor Lucky seems less family-friendly than you’d prefer, you can always call this Spook Doctor Lucky and give it a Scooby-Doo-esque twist. 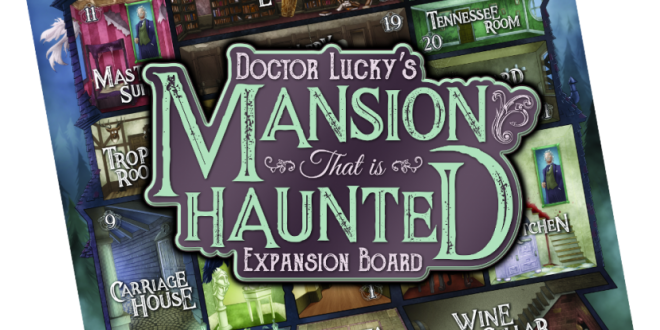 Doctor Lucky’s Mansion That Is Haunted (and the Deluxe 19.5th Anniversary edition of Kill Doctor Lucky) are available from Cheapass Games. And the expansion is also featured in this year’s Holiday Puzzly Gift Guide! And we’re continuing this series with me, your friendly neighborhood PuzzleNation blogger, as our latest 5 Questions interviewee! 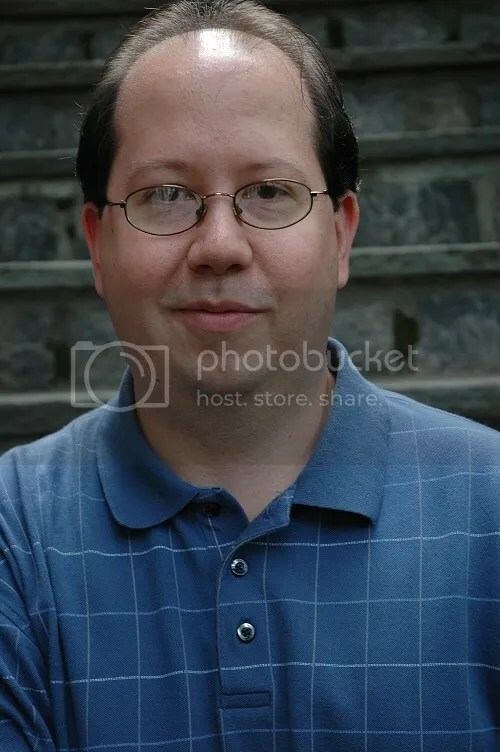 My name is Glenn Dallas, and I’m not only lead blogger for PuzzleNation Blog, but also Social Media Manager for PuzzleNation, maintaining and providing content for all of our social media platforms. 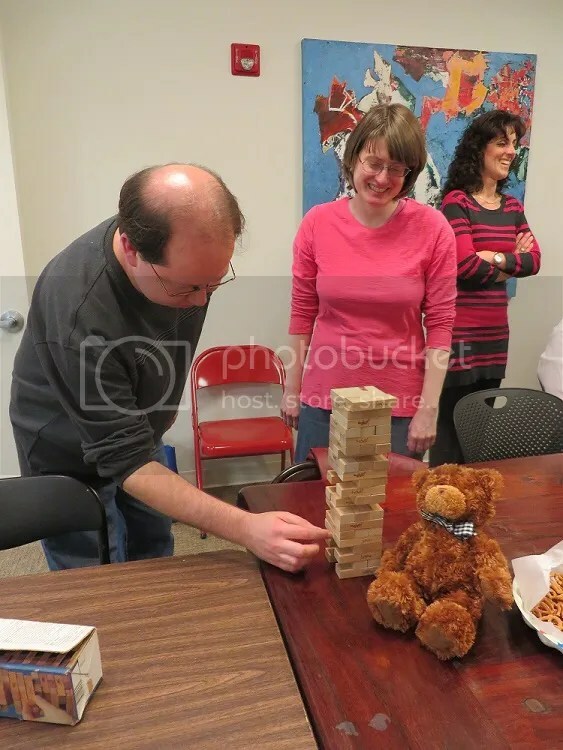 A lifelong puzzler and board game enthusiast, I try to infuse every blog post with that same level of dedication and passion. Hopefully, I succeed. I consider it a privilege for me to take some time out to talk to the PuzzleNation audience, so without further ado, let’s get to the interview! Looking back, it seems like puzzles and games were always around. My mother has always been a dedicated crossword solver. 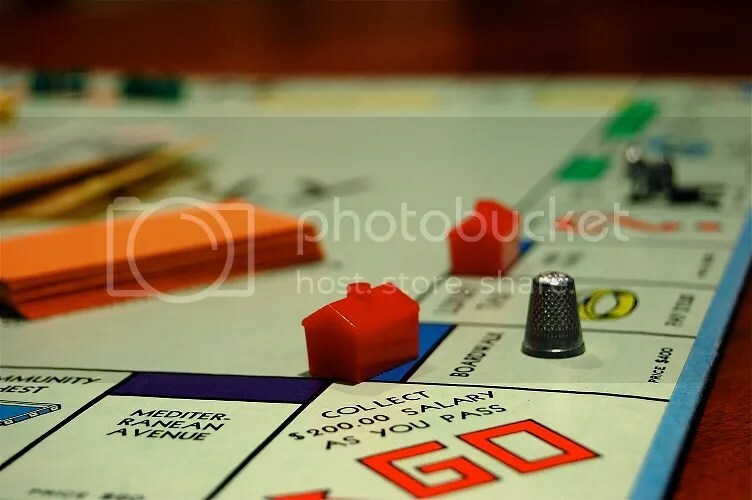 I can remember my older sister playing “School” with me and my younger siblings, using brain teasers and puzzles from old issues of GAMES Magazine as “lessons.” The classic board games were played often — Monopoly, Sorry, Mouse Trap, Battleship, even Trivial Pursuit, which I was probably too young for. But I’ve always been a trivia nerd. 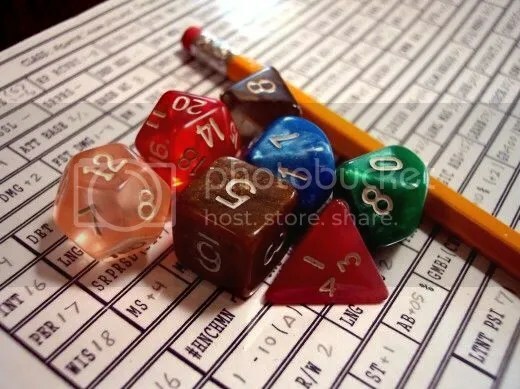 I got back into puzzles more directly in college when I began playing Dungeons & Dragons and other role-playing games, because I enjoyed challenging my players with tests beyond the usual monster hunts. So mechanical puzzles, sliding-block puzzles, and more Myst-style puzzle-solving became an interest (along with riddles and such). After college (and a stint as a TV cameraman), I had an interview at Penny Press and was hired as a puzzle editor, bringing my amateur puzzly skills into a professional setting working on traditional (and non-traditional!) pen-and-paper puzzles like word seeks, crosswords, cryptograms, fill-ins, etc. And more than a decade later, I’m still at it. 2. You’re one of the senior members of the PuzzleNation team, dating back to its earliest days. How has your work for PuzzleNation changed over time and what can you tell us about PuzzleNation as it evolves and moves forward? That’s true! Originally, I was just pitching in occasionally as a product tester — helping look for bugs or problems with early versions of apps — and I started providing ideas for content to our social media person for Facebook posts. I was a big proponent early on of expanding our efforts to include a blog; it’s a great centerpiece to a social media platform (and one that allows for more control than your average Facebook post). 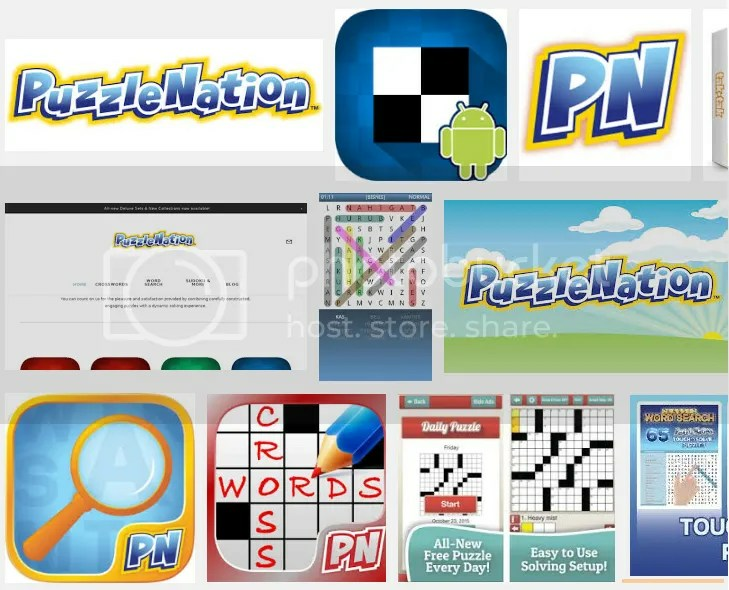 But I also wanted PuzzleNation Blog to be a hub for all things puzzles and puzzle games, because there’s not really anywhere like that on the Internet. If you like movies, there’s IMDb. If you like books, there’s Goodreads. You’ve got Gizmodo for tech, science, and sci-fi, and Board Game Geek for board games. And although there are plenty of terrific crossword blogs out there, there’s not one central place to go to talk about puzzles in general. I always envisioned PuzzleNation Blog as that place. So, as you can see, I’ve gotten a bit busier as time passed, expanding my duties and becoming the lead blogger on the site, writing three (and sometimes more) blog posts a week. I feel like the blog has grown and matured into what I originally envisioned — though there’s always room for expansion and improvement! — and my goal right now is continue maintaining that level of interest and quality. 3. The crossword has been around for over a hundred years, and many puzzles (whether pen-and-paper or mechanical) have roots that can be traced back even farther. What, in your estimation, gives puzzles such lasting appeal? I think it’s the Eureka! moments that keep people coming back. They’re certainly what I find the most enjoyable and the most motivating factor. And puzzles provide those in spades. When you approach a particularly fiendish brain teaser, or a crossword clue that keeps eluding you, or a mechanical puzzle that has you stymied, and then suddenly, that light bulb appears over your head. You’ve cracked the code, found the hidden latch, connected the missing pieces, made a deductive leap that would make Sherlock Holmes proud…those Eureka! moments never fail to make it all worthwhile. And when you work with puzzles, you get to see those moments more often than most people. 4. What’s next for Glenn Dallas and PuzzleNation Blog? For me, quite a bit. 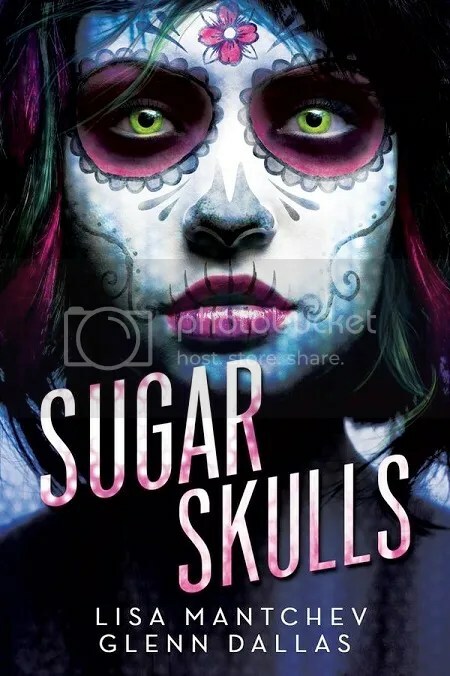 My writing partner and I just launched a new promotional blitz for the novel we published last year, Sugar Skulls (my first novel! ), and I’m deep into several ongoing writing projects, one of which is on track to wrap up before the end of the year. As for PuzzleNation Blog, I’m proud to announce that, after the recent success of our PuzzleNation team series of interviews, 5 Questions will be returning as a regular, recurring feature on the blog! It will be at least once a month (but hopefully twice a month), and I’ve already lined up our first guest for September, with more terrific puzzlers, constructors, and personalities to follow! 5. If you could give the readers, writers, puzzlers, and puzzle fans in the audience one piece of advice, what would it be? We spend so much time worrying about, well, everything, it’s easy to let the good stuff, the stuff that reinvigorates you and keeps your spirits up, fall by the wayside. So make a little time for you every day. It does wonders. 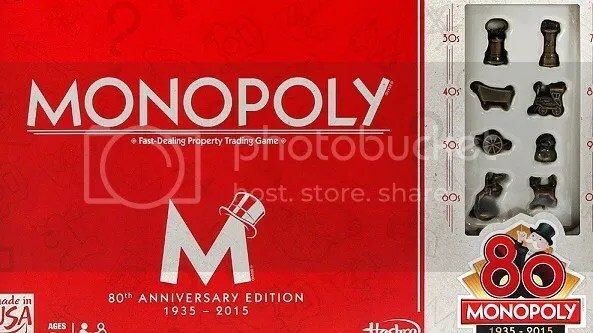 Monopoly is celebrating its 80th anniversary this year, no small accomplishment in the world of board games. Available in 43 languages and sold in 111 countries worldwide, the most ubiquitous board game in history is launching a few special promotions to commemorate their eight-decade anniversary. In the US, they’ve released a special anniversary edition of the game, featuring game tokens representing different decades. In France, however, the prize is a little bit sweeter. You see, 80 special sets of the game will be distributed to stores, each with a special bonus: real money mixed in with the Monopoly money. Only one set will land the major jackpot, in which every game note is replaced by real money — for a total windfall of 20,580 euros ($23,268). In addition, 10 sets will contain five real 20-euro notes, two 50-euro notes and one 100-euro note. 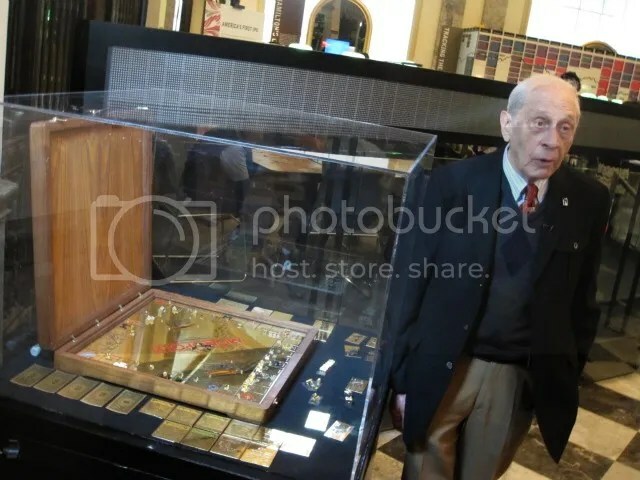 A lesser prize can be scooped in 69 sets, which will have five 10-euro notes and five 20-euro notes. Evenly distributed among the many variations of the game currently available — junior and electronic editions included — the anniversary sets are out there right now, waiting to be claimed. 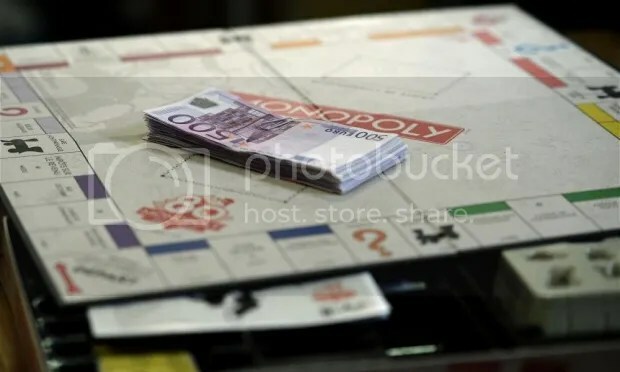 This follows in the fine tradition of other specialty Monopoly sets over the years, like the all-chocolate entirely edible version of Monopoly Neiman Marcus sold in the ’70s, or the $100,000 version produced for FAO Schwarz that included emeralds and sapphires embedded into the game board and real U.S. currency. And you can’t help but wonder if other board games will follow suit for their big anniversaries. Imagine Mouse Trap with a real mouse, or Fireball Island with a real gemstone in the center. Heck, an anniversary edition of Hungry Hungry Hippos that includes a real hippo would certainly make for some great press! As long as nobody tries to release copies of Pandemic with an actual virus, we should be good.